"Whether a cat is black or white makes no difference. As long as it catches mice, it is a good cat." (CNN) -- Deng Xiaoping's greatest contribution to modern China came when this veteran revolutionary was well into his 70s, and the backlash against the Cultural Revolution had propelled him to the top of China's ruling elite. 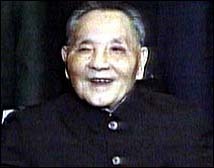 Ascending to power in 1978, Deng ridiculed the Cultural Revolution slogan that held it was "better to be poor under socialism than rich under capitalism." The blunt, practical Deng offered instead: "Poverty is not socialism." He encouraged the creation of a market economy and capitalist-like enterprises, and by the early 1990s his reforms had helped lift an estimated 170 million peasants out of extreme poverty. Yet he refused to abrogate, either because of temperament or politics or both, the power of the Communist Party over the lives ordinary Chinese citizens. To do so would have meant abandoning the Marxist-Leninist-Maoist ideology on which the People's Republic of China was founded in 1949. Such inflexibility is believed to have been behind Deng's apparent approval of the brutal suppression of unarmed demonstrators in Beijing's Tiananmen Square in June 1989. Born in 1904 to a prosperous landowner in a village 65 miles from Chongqing in the south-central province of Sichuan, Deng turned to revolutionary thought early, and his résumé as a Communist is almost as long as Mao Tse-tung's. 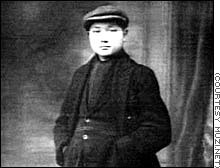 While studying in France in the early 1920s, Deng joined a movement of young Chinese leftists led by Chou En-lai. In 1924 he changed his birth name, Xiansheng, to Xiaoping (Little Peace) to mark an important new phase in his life, a Chinese custom. Years of guerrilla war followed. 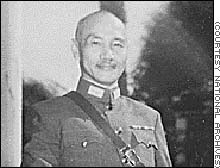 Short (5 feet 2 inches) but physically tough, Deng joined the Red Army's legendary Long March of 1934 and helped lead the military campaign of 1948-49 that overthrew the Nationalist regime of Chiang Kai-shek. Deng rose quickly through the party ranks once the Communists seized power in 1949, becoming general secretary in 1955. Deng's pragmatic ideas for economic development, however, often put him at odds with Chairman Mao, who emphasized egalitarian policies and revolutionary zeal. Deng's remark about the irrelevance of color to a cat's mice-catching ability came during one of their feuds over economic policy in the early 1960s. Mao once complained that Deng treated him "like a dead ancestor" and later quipped, "Which emperor authorized that?" when Deng ordered the turnover of collective lands to individual peasants to help relieve the famines of 1959-62 that resulted from Mao's failed Great Leap Forward that began in 1958. Perhaps the most remarkable turns of Deng Xiaoping's career were his amazing comebacks from three political purges. Fellow revolutionaries ousted him in 1933, but he was back in good standing a year later. His 1966 fall from grace would last far longer. Responding to the famines induced by the Great Leap Forward during which an estimated 30 million people died, Deng proposed major reforms, such as free markets for farmers and incentive bonuses. In short order he was denounced as a "capitalist roader," held under house arrest for two years, paraded in a dunce cap through the streets of Beijing and forced to wait tables at a Communist Party school. In 1969 Deng, his wife Zhuo Lin and several of his five children were exiled to Jiangxi province in southeastern China. 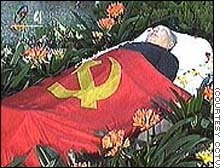 The Cultural Revolution was in full swing, and Deng later said only a personal security team supplied by Mao protected him from being killed. 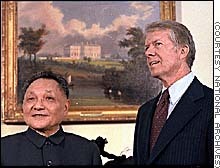 Deng meets with U.S. President Jimmy Carter in January 1979. Deng's goal was a wealthy, modern, powerful China, and he opened the door to new relations by establishing ties with the West. Premier Chou En-lai brought Deng back into the party leadership in 1973. 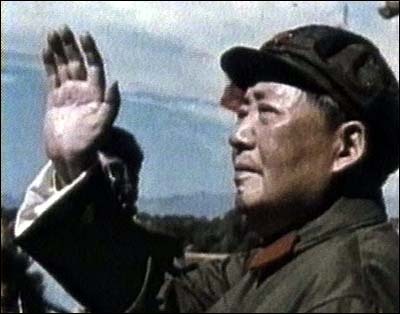 Turmoil at the top increased after Mao's death in 1976 and Deng was briefly purged for a third time. By late 1978, however, Deng and his supporters held a working majority in the party's leadership. Although Deng never assumed the title of Communist Party chairman, he did take the title of chairman of the party's Central Military Commission, which gave him control of the People's Liberation Army. It had been Mao's most important title, the key to controlling a nation of diverse cultures that now numbers more than 1.2 billion people. One of Deng's first reforms was to abolish Mao's rural agricultural communes and allow peasants to cultivate family plots. Grain harvests quickly increased, and other reforms followed. City dwellers were allowed to start small-scale businesses, ordinary Chinese were allowed to buy consumer goods, and Deng actively courted international investors. He also imposed tough population controls that included forced abortions to limit families to one or two children. 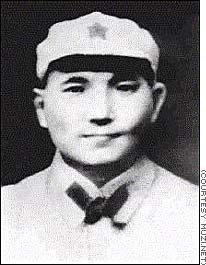 Deng pushed to remake education in China, charging the Cultural Revolution had produced "an entire generation of mental cripples" by shutting down schools and sucking the student population into the ubiquitous Red Guards. Deng allowed students to go abroad for college, sparking a craze for learning English. Perhaps Deng's most glorious year was 1984, when he reached 80 years of age. China's food supply hit 400 million tons of grain, making the nation self-sufficient in food. That same year Deng successfully negotiated an agreement with the British government to return Hong Kong to Chinese control in 1997, the year Britain's 99-year lease on much of the territory was to expire. Throughout Deng's economic reforms, however, he kept an iron fist ready to crush any threats to the nation's Communist dictatorship. In Deng's final five years, virtually all of China's dissidents were imprisoned or exiled abroad. Deng also supported the use of tanks and guns to end the 1989 pro-democracy demonstrations in Tiananmen Square, where hundreds of students and bystanders were believed to have been killed. That same year Deng gave up his chairmanship of the military commission, and his influence over China's ruling elite steadily declined through the 1990s until his death in February 1997 at age 92. Deng left China a more stable and prosperous nation than at any time in the 20th century, but its authoritarian government and one-party system were still firmly in place.